While blog-hopping, I have seen these posts before, but hadn't taken the time to find out what the meme was really about. 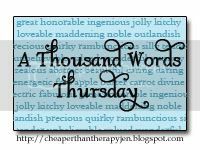 Today I stopped by My Divine Chaos, who participates in A Thousand Words Thursday and I enjoyed her post. From there I visited Cheaper Than Therapy where Jen hosts the weekly meme. So now I get it. And I love it. I'm a photo nut. I love capturing family memories on film (or more correctly these days, in pixels.) I snap a lot of shots. And every once in a while I get one that's just priceless. So, today I'm joining in. It's a little late in the day, I know. But, better late than never I always say. From Jen about the meme: "Every Thursday I am going to post a picture that is powerful, that expresses emotion, and speaks volumes to me. Here's one that is worth a thousand words." Beautiful photo! Love everything about it. ah hah - I never knew what this was either! That would SO be in a frame on my wall! Beautiful! That is such a sweet picture. I love moments like that. What a great picture! I love it!